Oral DHEA administration to patients with hypoadrenalism, in addition to glucocorticoid and mineralcorticoid replacement, may improve both well-being and hormonal/metabolic parameters. Twenty patients (13 men, 7 women, 26276 yr, 11 with Addison’s disease, 9 with central hypoadrenalism) were recruited in a placebocontrolled, randomized study. Hormone levels, carbohydrate and lipid parameters, bone metabolism, body composition and psychological parameters were evaluated at baseline and after treatment with DHEA 50 mg/day or placebo for 4 months. After 4 months of DHEA administration, serum DHEAS levels raised both in men (from 0.71±0.18 to 8.28±1.66 μmol/l, p<0.005) and in women (from 0.25±0.07 to 5.65±1.93 μmol/l, p<0.05). Only in hypoadrenal women an increase in testosterone (T; from 0.4±0.1 to 1.45±0.26 nmol/l, p<0.05) and androstenedione (A; from 0.86±0.34 to 2.05±0.29 nmol/l, p<0.05) levels was observed. 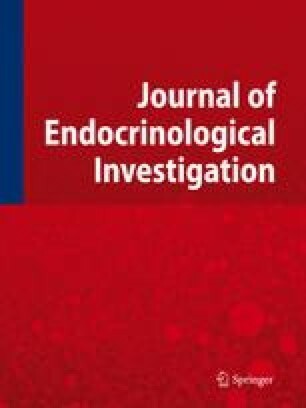 In men no significant modifications in T and 17-hydroxyprogesterone (17-OHP) levels were found, whereas serum SHBG significantly decreased. As far as the metabolic parameters are concerned, only in patients with Addison’s disease a significant decrease in total cholesterol and in low-density lipoproteins after 4 months of DHEA administration was found. No changes in glucose metabolism and insulin sensitivity were observed. In basal conditions, mean serum osteocalcin (OC) was normal and significantly decreased after DHEA treatment. A significant reduction in body fat mass percentage (BF%) after DHEA administration was observed. As far as well-being is concerned, DHEA replacement did not cause any relevant variation of subjective health scales and sexuality in both sexes. Our study confirms that DHEA may be beneficial for female patients with hypoadrenalism, mainly in restoring androgen levels. Concerning the health status, more sensitive and specific instruments to measure the effects of DHEA treatment could be necessary.